Provide comfort for the family of Janet Lang Boland with a meaningful gesture of sympathy. Janet died peacefully at her home in Toronto on February 19, 2019 after 95 wonderful and vibrant years of life. Janet was elegantly able to combine a career as a legal trail-blazer with the role of dedicated wife and mother. Surviving Janet are her two sons, Christopher (Tara Mackenzie) and Nicholas (Laura Gartrell). Janet was predeceased by her son, Michael (Catherine Taylor). Janet's charm, pursuit of excellence and adventurous spirit lives on in her nine grandchildren, Andrea, Cavan, Tiernan, Cameron, Christopher-Charles, Nicole, Johnny, Natalie and Kate. They all admire her as a role-model and affectionally called her "Jannie." She was born in Kitchener on December 6, 1923 and was the eldest daughter of George and Miriam Lang. Following in her mother's footsteps, Janet attended the Kenwood Convent of the Sacred Heart in Albany, New York. Upon completion of high school, Janet returned to Canada and attended Waterloo Lutheran College (now Wilfrid Laurier University), where she was the editor of the school newspaper and President of the student body. In later years, she would be given an honorary doctorate from Laurier, and in 2011 she was recognized as one of their top 100 alumni. From 1947 to 1950, Janet attended Osgoode Hall Law School, spending the summer months as a counsellor at Camp Wapomeo. This is where she met her future husband, John Boland. The couple was married in 1949. Although Janet's first inclination was to give up her legal career to raise a family, she continued to practice law at the urging of her father. Janet quickly found that she loved, admired and respected the law - she had found her calling. While raising three sons with her husband John, she developed a commercial law practice with the firm White, Bristol, Beck and Phipps. She was appointed Queen's Counsel in 1966 and in 1969 became a partner in the firm Lang, Michener. At the time, few women studied and practiced law. 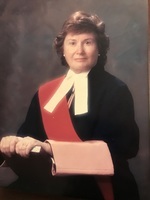 In 1972, she was appointed as a County Court Judge, and in 1975 she shattered the glass ceiling by becoming the second female Supreme Court Judge ever appointed in Ontario. Intrigued with a new concept of joint custody, she introduced the principle in the first Canadian decision regarding the matter, in Baker v Baker, which was a highly controversial concept at the time. The Ontario Legislature quickly jumped in and recognized the principle, breaking legal ground in Canada and helping to establish the principle of joint custody around the world. Janet's legal career spanned an impressive 60 years. She would not have been able to balance her career as a lawyer, judge, wife and mother without the pivotal support of her husband and two very special women - Martha Branagh and Alice Pexioto. Janet had the incredible quality of staying positive and moving forward, even in the most difficult of times. She forged ahead when her husband John sadly passed away in 1976. Janet was devoted to her two younger sisters, Sheila Hinton (Hal Hinton) and Joan Farrell (Colonel Peter Farrell); as well as her nieces and nephews. Although the "3 Sisters" were often separated by large distances, they always brought their families together. In the 1980s, they conspired to create a family golf tournament called the "Lang Cup" which spans borders and generations. It continues annually to this day with an ever-expanding roster and level of enthusiasm. Janet was fortunate to find true love a second time when she married Dr. Taylor "Tay" Statten, father of Lyn Statten (Fred Boden), Judy Walter (Eric) and Taylor "Tike" Statten (Suzanne). Dr. Tay passed away in 2016 at the age of 101. Janet's affection for the Statten family was a highlight of her last 20 years. Janet was an avid golfer during her entire life and served as the President of the Canadian Women's Senior Golf Association. In the winter months, Janet enjoyed skiing and was an original member of the Georgian Peaks Ski Club. Janet golfed well into her nineties and even when she gave up skiing she lived vicariously through the ski trips of her family. She loved adventure, travel and spent a good portion of her summers in the wilderness of Algonquin Park. Her passion for bridge kept her playing four times a week right up until the day she died. The family will forever be grateful for the tremendous care and friendship given to Janet over many years by Catalina Luceno. Janet is sure to be Swinging in the Moonlight with some of her favourite family and friends. In keeping with her wishes, cremation has occurred. A funeral Mass will take place at Our Lady of Perpetual Help Church, 78 Clifton Road, Toronto, Ontario on Friday, March 22. 10:30 a.m. There will be a visitation on Thursday, March 21st from 2:00 to 4:00 and 6:00 p.m. to 8:00 p.m. at Humphrey Funeral Home, 1403 Bayview Avenue. Donations in Janet's memory may be made to Taylor Statten Camping Bursary Fund. Online condolences can be made at www.humphreymiles.com. To send flowers in memory of Janet Lang Boland, please visit our Heartfelt Sympathies Store.